Week six in the National Football League features the Oakland Raiders visiting the Los Angeles Chargers in a marquee matchup that brings us the quick release of quarterback Derek Carr against the speedy pass-rushing duo of Melvin Ingram and Joey Bosa. Ingram and Bosa have 12 sacks between them this season and are easily one of the best pass-rushing duos in the NFL. Each of them had two sacks in week five against quarterback Eli Manning of the New York Giants. 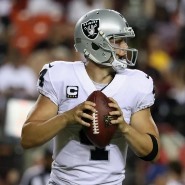 The key question for the game against the Raiders will be whether they can get to Carr before he lets the ball fly as he uses just 2.2 seconds to snap and throw the ball to his receivers, the fastest time in the whole league. Carr is expected to be back from injury this week and to get to him they will have to be very fast. This will be a battle between speed off the edge of the line against speed from inside the pocket. The Raiders’ main concern will be protecting Carr enough to see if he can perform as the Carr of last year, or if the injury will limit him. The sleeper for the Raiders in this game will be running back Jalen Richard. Marshawn Lynch may get all the attention in Oakland’s backfield, but he’s averaging just 3.4 yards per carry. Richard, on the other hand, has averaged 5.3 yards per run, but the problem is that he’s only averaging 4.8 carries per game. At some point, head coach Jack Del Rio may need to think about giving him the ball a little more. The Chargers are the perfect team to employ a heavy run-first strategy. No team has given more yards on the ground than Los Angeles (161.2 per game). Defensively none of these teams are good in keeping opponents from converting on third down percentage. The Chargers are allowing 44 percent of third downs to be converted (26th), while the Raiders have been even worse allowing 46 percent of third downs chances to be converted (tied for 28th in the league). The Raiders are also allowing a passer rating of 138.1 on third down, which is the worst in the NFL. For the Chargers wide receiver and first-round draft pick, Mike Williams is expected to make his season debut as he returns from a back injury.